Find My Workspace lists over 95% of the executive office suites market in San Francisco. Simply click Request Quote to check pricing for one office, or Add to Basket for multiple offices. This center is a space where ideas meet execution. We believe that the more ideas are realized the better the world will be. The community cultivates an experimental environment through co-working, education, and events. Launched in 2008 by an innovation agency that helps organizations build growth at startup speed. With offices in Paris, San Francisco, Lisbon and Toulouse, analysts, engineers & designers work with many of the largest companies and government organizations in the world to improve their innovation capacities, discover new possibilities for digital growth, and execute on these discoveries. 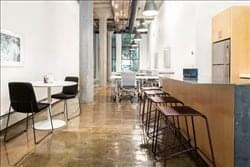 Located in the heart of SoMa, San Francisco this center is one of the most unique coworking spaces around – Think of it as Tech Shop meets coworking space where you can create and design as well as network, collaborate and build your business in a professional shared space. This center has all the office amenities of a traditional coworking space and added to this is a fantastic maker space. It has office space, fabrication space, sewing equipment, shared tools in a workshop area, meeting rooms, a kitchen, classes, and events. This is a unique space for creative people to work and collaborate together. It is based in the belief that together we can create greater things than we could individually or in isolation. 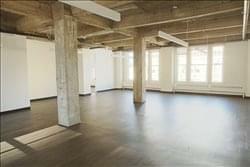 Recently built, this new to the market space provides the most flexible office lease in the San Francisco area. Whether you are looking to lease on a month-to-month basis, for up to a year, or lock into a two-year agreement, this center is perfect for all needs. With workstations for up to 42 people, a conference room, kitchenette and multiple lounge areas, this site comes move-in ready from the time you sign your lease. Other amenities include best in class high-speed WiFi, weekly cleaning – frequency based on your preference, and also includes access to other centers worldwide. Layout provides options for interaction and privacy. This is is a professional, driven, and intimate space designed to help the community members focus on growing their business. This center cultivates an all-inclusive environment where your day to day logistics are no longer an issue. It provide support for COWORKING, VIRTUAL OFFICES, and EVENTS. Launched in 2012 by an innovative membership only hotel group, that helps organizations travel with ease. This center was created to help support start-ups and small businesses as they capacities, discover new possibilities for digital growth, and execute on these discoveries. This beautiful and exquisitely supplied business center offers 3000 square feet of spacious and highly premium office space available to prospective tenants on flexible terms of occupancy. The center offers professional clients with exceptionally versatile space that can be rented whole or in part, to provide significant ease of residence for any type of professional in search of high end workspace at favorable rates. Including a kitchen, two large conference rooms, two bathrooms and a large and comfortable common area for all tenants, this business center location is the ideal space for technology or start-up companies. This center is a hub for entrepreneurs and their teams in their early days. 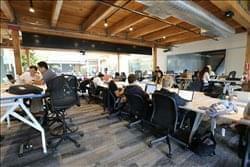 The space is located in Howard Street where more than 70% of the startups in San Francisco are within a three block radius. 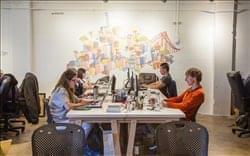 The center offers 24/7 access to shared and dedicated desks, organize networking events, workshops, pitching competitions and most importantly the space is made up of a unique startup community. 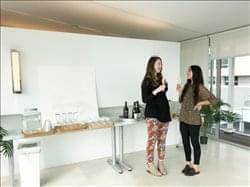 The booking includes access to a fully stocked kitchen, conference rooms, phone booths and a personal locker. This center is a trifecta of coworking, demo and event spaces strategically located at Westfield San Francisco in the epicenter of downtown, where tech and retail marketplaces converge. The amenities are like none other including a bouldering wall, bocce ball court, sleep nooks, unlimited Philz coffee and 15+ conference rooms and meeting spaces. 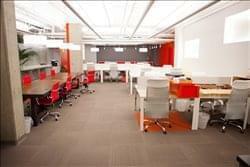 The center offers shared desk, dedicated desk and private office options with flexible leases to support team growth. As a boutique coworking space, the team is hyper-focused on enhancing your office experience so that it truly feels like a home away from home. It also has a Corporate Innovation program that gives the startups the opportunity to connect with brands and retailers and test in the Westfield properties. Opening in August of 2019, this location offers businesses with an open layout that includes 6,618 sq. ft. of space that is fully customizable. Flexible terms ensures that your company is able to select the best plan available for them. All in one pricing comes standard, making sure that you will only pay for what is needed. Companies can work with the in-house interior design team, included in the pricing, to create a space that is truly something that they can call their own. Fully accessible kitchen doubles as a break/lounge area for employees. Floors come with a mixture of carpet and hardwood floors. It’s time to expand your mind, network and business, make connections that matter and introduce your team to an artistically designed space that will help them realize their dreams. 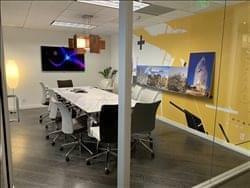 Amenities on offer at this center include, Plug & Play, fully furnished offices, ultra-fast Wi-Fi, meeting rooms, event space, 24-hour access, coffee, soda water and refreshments, IT support and private phone booths. This space is artistically designed to help you realize your dreams, with one-off artefacts, handpicked vintage furniture, towering bookcases, and walls painted with thought-provoking messages. Your environment should inspire you and your team to achieve extraordinary business. There’s an energy in the atmosphere that ignites fires. 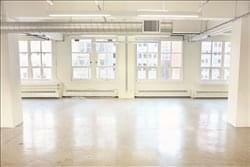 *Brand New* private offices in the heart of Financial District. We bring tech entrepreneurs, startups, and corporate innovation professionals together. 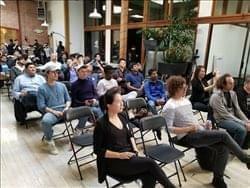 This space surrounds its members with the perfect ecosystem of resources that they need to grow including unique access to corporate brands, venture capital, partnerships, speakers, and mentoring. With city views, a dynamic community, and tons of resources and amenities, this is an incredible place to collaborate and get work done! Hot desks, fixed desks, dedicated offices for teams of up to 7 people for founders and doers at affordable rates, with flexible terms. All offices have exposed brick, extremely high ceilings, 24/7 access + global member benefits in 7 cities. Starfish Mission hosts several highly curated industry events per week. Members get preferred scheduling for venue booking + sponsorship for meetups. This is a zero-equity launchpad and open P2P incubator. Amenities include printers, free coffee, tea, snacks, music stations, whiteboards, projectors, TVs, podcast studio, media production studio, free happy hours and more. We are open to blockchain builders, founders, innovators, learners or creators, with a collaborative mindset. This workspace is thoughtfully designed to bring you both collaborative and private workspaces to suit your individual needs. Members have access to private phone rooms, conferencing rooms, break-out areas, and a new mothers room, as well as plenty of other amenities such as craft coffee, and treats to keep you and your team going throughout the working day. All in one pricing takes all of the worry away from the lease holder and includes everything that a business needs, including maintenance, IT and furniture. Flexible, low risk terms allow for your company to expand as needed or maintain the space size as planned. Exposed ceilings, abundance of windows and polished concrete floors are a few of the features that come standard with this location. With interior design included, the open layout allows for a company to truly customize the 5,631 sq.ft. that is available at this location. This center was designed to provide a head turning experience. 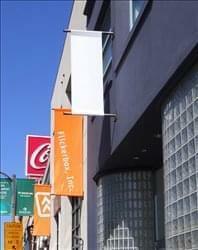 A recently renovated office space in the heart of SOMA, on the corner of Mission and New Montgomery. The office space is modern and comfortable, with spare offices for private business calls. It is located in a Class A Commercial Building, with views of the rear of the MOMA, a kitchenette, lunch area, and conference room. The desk space(s) have desktop computers, a new printer, and large windows that create natural light. There is front-desk and security service as well as on-staff building maintenance. The office is cleaned private on a bi-monthly basis to ensure and maintain cleanness on a regular basis. San Francisco, San Francisco - New Montgomery St.
We are changing the way the world works by approaching workspace unconventionally. It’s not just about the space, it’s about the people and the way they work. Environmental psychology drives our designs and allows us to positively impact businesses by putting people at the center of what we do. We create innovative environments that embrace different business models, different brands and different ways of ways of working. Our members are able to focus on what’s important to them because we focus on and understand their business needs. They decide the best type of environment for them to thrive in. Whether it be at their desk, a quiet place to focus or a more interactive area to collaborate, they feel comfortable and confident doing their best work. Our solutions are designed to to fit each member company’s unique needs. It’s what we call werqing wisely. Introducing a technology campus for high-growth startups and corporate innovators. This space is a technology campus headquartered in the heart of San Francisco, and since 2011, has been helping tech entrepreneurs, startups and corporate innovation professionals bring the future to market. It offers services to its’ members including; programming, consulting, events, and office-as-a-service, which together create the perfect ecosystem and community for innovation to thrive. Select startup alumni include Uber, Spotify, Practice Fusion, and Leap Motion, and the roster of Corporate Innovation Services clients include Schneider Electric, Converse, Tata Communications, Royal Bank of Scotland, Pfizer Consumer Healthcare, Samsung, and ABinBev. The center features everything from hot desks, to dedicated desks, and private offices, complemented by many amenities – ideal whether you’re starting fresh, or just expanding rapidly. This building is much more than a venue – it’s an experience. Is housed near the award-winning Tehama Grasshopper building, events hosted here are truly one of a kind. The three-story building is the perfect space for events of all sizes. Rent the first-floor space with vaulted ceilings and exposed pipes, ideal for a gallery showing or company off sites, or leverage the second floor for conferences, wedding receptions, and seated dinners. The third floor can be used alone, or in conjunction with a second-floor rental, offering a unique rooftop room encased in floor to ceiling glass, featuring views of downtown. The rooftop patio is one of the many features creating a unique event space in the heart of SOMA, less than a 10-minute walk from Moscone. San Francisco, California - Tehama St. The Front Door of the Tech Industry Located in SoMa, This office in San Francisco takes collaboration to a whole new level, with five floors of creators, innovators, and passionate learners. And don’t forget the rooftop, with gorgeous views of downtown and the San Francisco Bay. From events to the thriving startup ecosystem to the top tech talent from our Web Development and Data Science programs – our SoMa campus provides the opportunity to learn, connect and build your company. This campus is full of energy, intelligence, and motivation – we welcome you to walk through these doors, join our community and be inspired to level up. This space is located in the heart of San Francisco’s Embarcadero Center. This iconic location is the perfect workspace for any type of business, from touchdown space for Silicon Valley startups to quarterly meetings with your clients based in the Financial District. Impress anyone visiting your space with views overlooking Ferry Park, and hundreds of shops and restaurants a step away. Flexible term office space offering ideal professional workspace solutions to any and all particular business equirements and commercial needs with high-quality services and facilities providing on-site support and assistance to professional tenants and business clients throughout the surrounding areas. The professional and functional environment of this business center is in the heart of San Francisco’s South of Market district. The creativity of the businesses already in the surrounding area as well as already in the center makes for great networking and possible collaboration opportunities. Rent the most flexible office space in the San Francisco area on a month-to-month basis for up to one year in length. This office comes fully furnished with styles to fit any business culture. The building is comprised of townhouse style units accessed directly from a street and backing onto a shared courtyard. 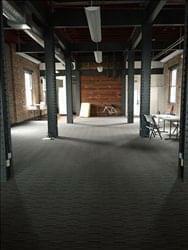 The space has a fully enclosed second story breakout room as well as an open loft. Fully equipped with a kitchen, a restroom with a shower, desks, lounges, and an outdoor courtyard to excite your team about their workspace perks. The kitchen also doubles as a lounge area for employees to breaks as needed.